This beautiful ceramic alpaca is hollow inside to house a nativity manger scene. 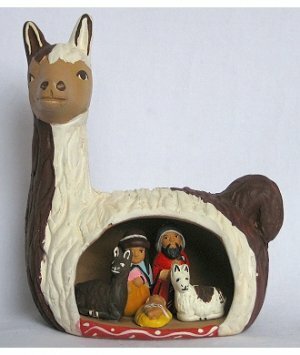 Hand-crafted and painted by the Artesano's in Peru, this item beautifully fuses two major themes prevalent in South American life: Catholicism and the alpaca. Size: Measures appx. 4-1/4 inches wide, by 5-1/4 inches tall. Each piece is unique, colors may vary slightly from this image. Special Notice: Due to the nature of this product, adult supervision required for young children. If this nativity set or any toy ordered is intended for a young child, please assume the following warning applies: Warning: Choking Hazard due to small parts. Not intended for children under 3 years of age.